Gong Hei Fat Choi and Thank you! It’s February already! Where does the time go? Well we can tell you the first half of the term may have passed in a flash but we squeezed so much work and fun into the first 6 weeks of the year. Where to begin! Firstly we’d really like to thank everyone who came to our coffee morning last term, the funds you generously raised contributed to the purchase of our new materials. 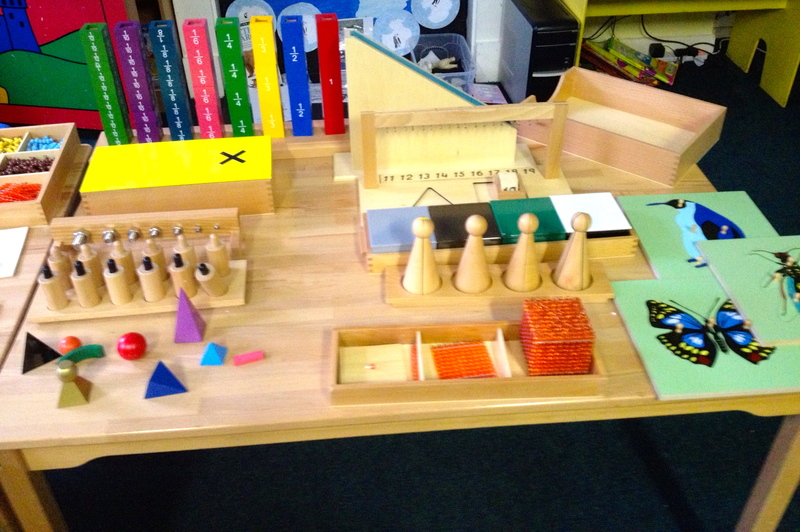 Replacements for materials that have been loved so much we needed to get new ones and many advanced and new materials to extend our learning. Everyone is so excited about the new work., students and teachers alike. It’s wonderful to hear the children exclaim, “I cant wait to start my work” or “I love this school so much” as they do every morning. 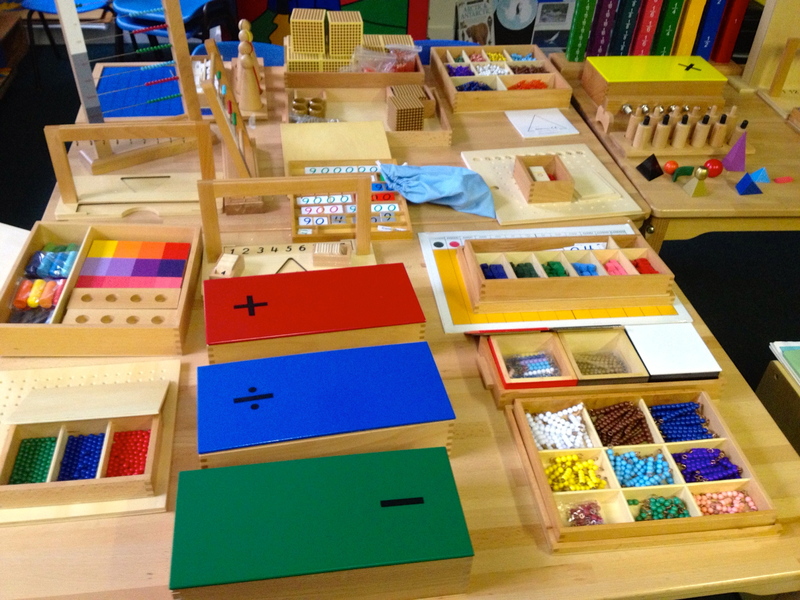 Over hearing one young student tell his classmate “I’ve told my mother a million times I love Hedley Park” as he counts to a million with the new maths materials is so heart-warming. We are so lucky to have the wonderful students, parents and staff to make up the place that is Hedley Park. Looking back at the work we have done in the last month, it is almost overwhelming when you see it all together. 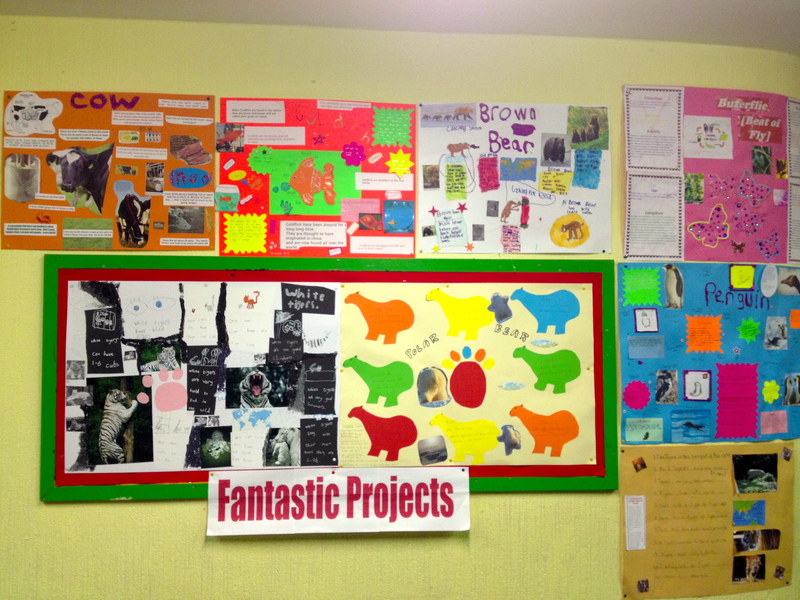 Over the course of the month the children work at new group projects and that work is displayed in their classrooms, this is only the tip of the iceberg. They also work on individual pieces in their own books and much shelf work, which does not create “display” but leaves the student with a lasting love of independent learning and self-discovery. Our senior class have been working on not one but two group projects this month. 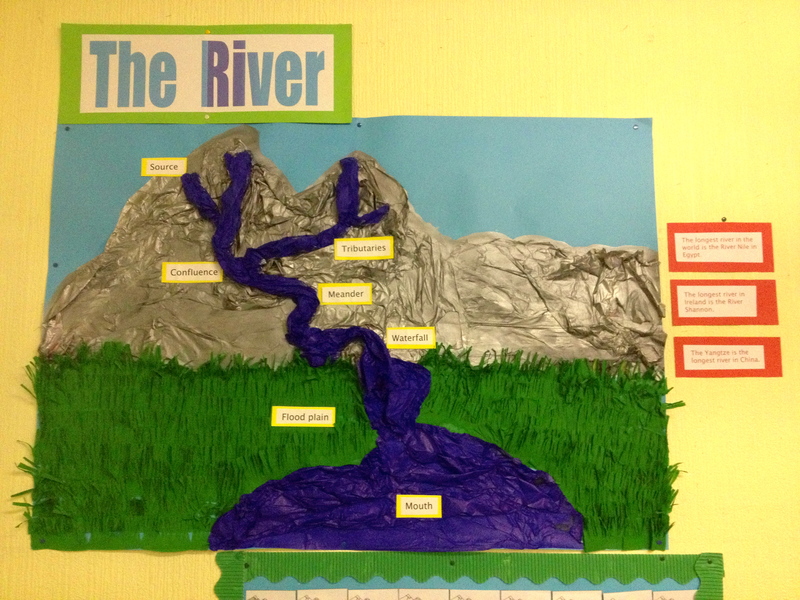 The first was on the topic of rivers; they created a wonderful 3D wall display on the parts of the river and are creating individual booklets on other land and water formations. 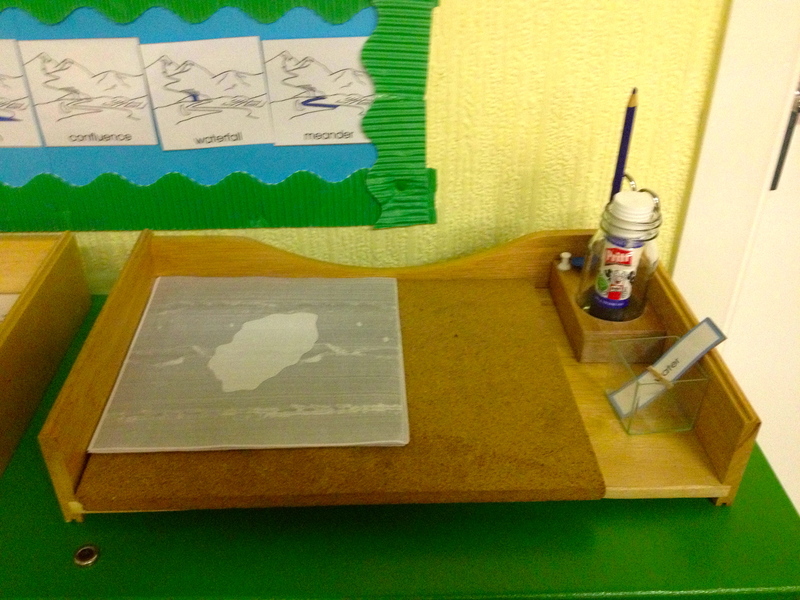 Carefully pin poking each land and water form out, illustrating, labelling and gluing into their booklets. 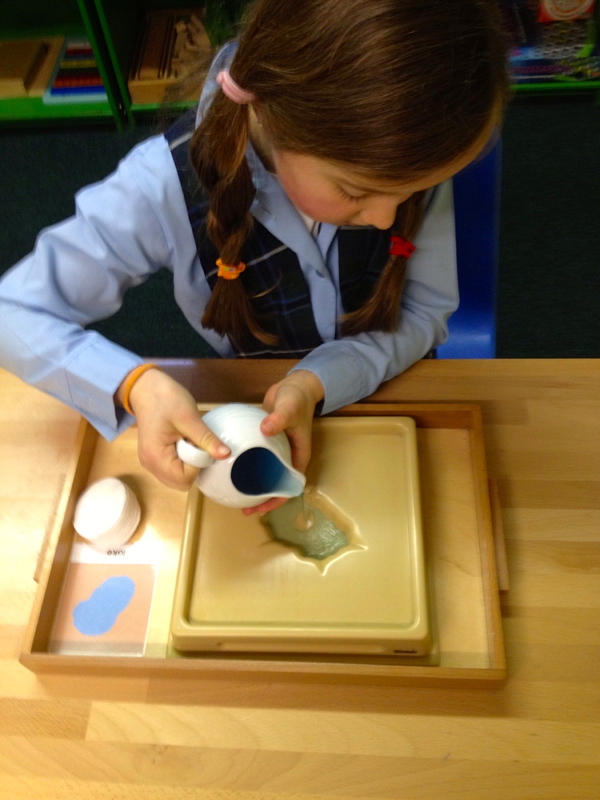 Exploration with the land and water form materials really serve to concrete this in the minds of our students. 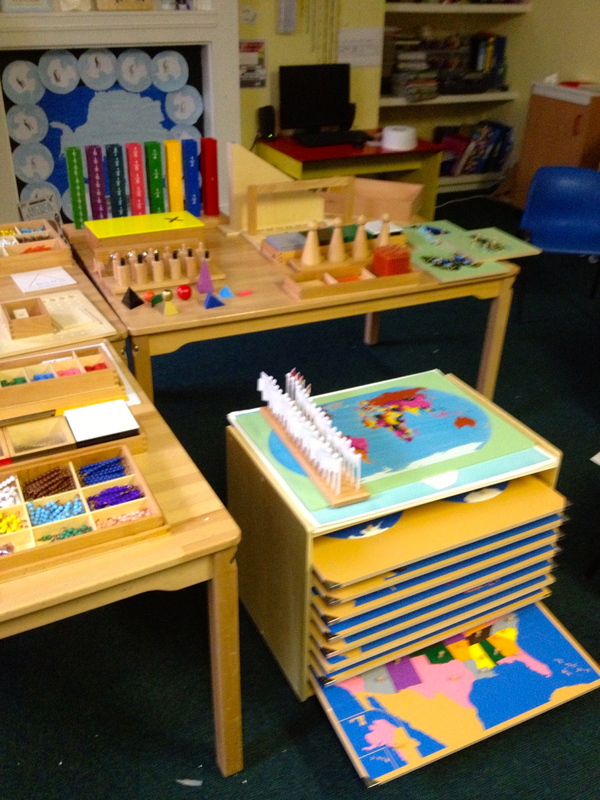 The careful use of these materials brings a wonderful moment of zen amidst the buzz and hubbub of an active classroom. The second group project was in preparation for our favourite annual event , Chinese New Year. 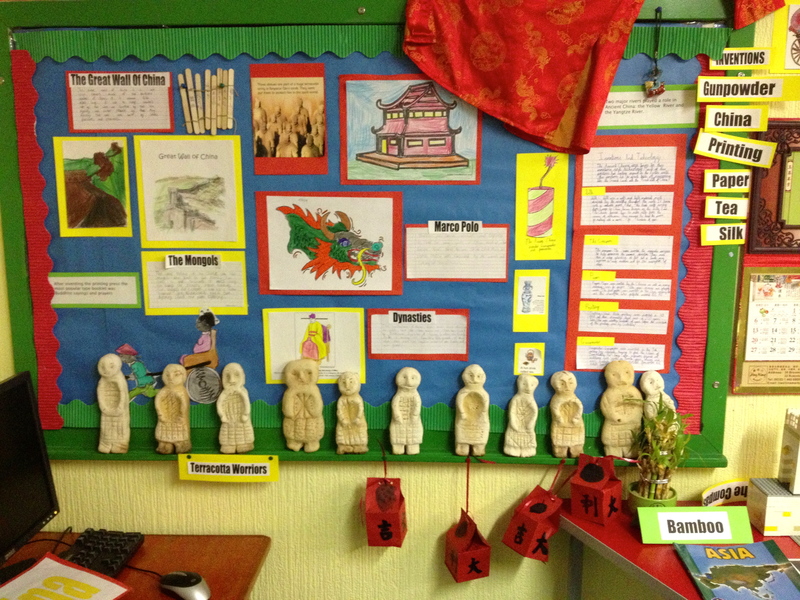 Everyone chose an aspect of Chinese history, which they researched and summarised in their best penmanship. 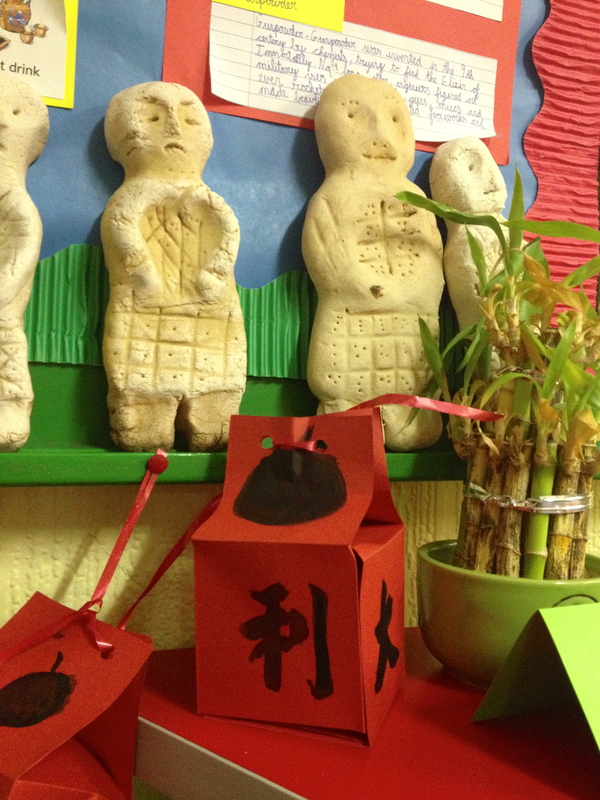 Creativity to the fore each student made his or her own Terracotta Warrior and Lai See for good luck! They even got to use authentic wolf hair brushes to decorate their Lai See with calligraphy during Mandarin class with Evan. I love how each year the celebrations and project work reflects the individual interests of the children in the class, this year a wonderful Lego Great Wall was built! 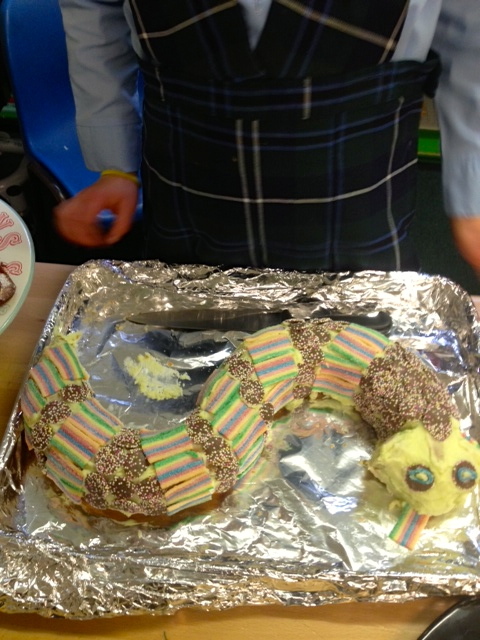 It being the year of the snake we had representations of the serpent in cake and in majestic art form. Of course on the final school day before the celebrations we all gathered for a Chinese banquet as guests of the senior class. 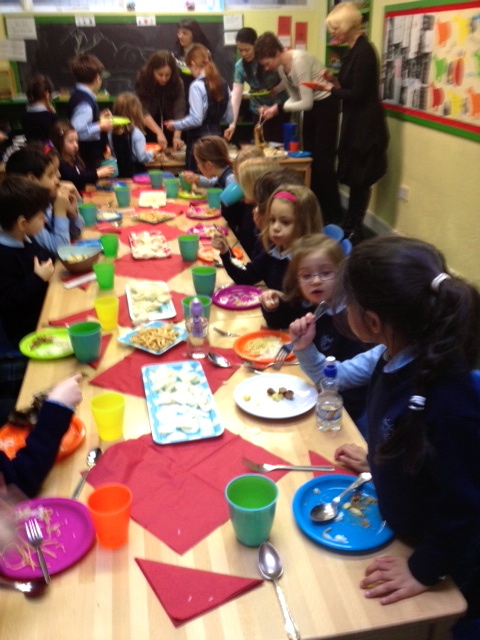 It was lovely to share food and wish each other Gong Hei Fat Choi! The senior class also presented their individual animal projects to the junior class. Each student chose an animal that interested them and researched using ipad apps, the internet and the many many books available in the school library. Interesting facts are written out in their best handwriting and photos printed and compiled to create a beautiful display. Each student then presents to their peers and the junior class and answers questions after the presentation. The confidence gained by the students in such presentations is undeniable, and for those who are seniors in the class you can see the benefit of such presentations in their research and public speaking abilities. 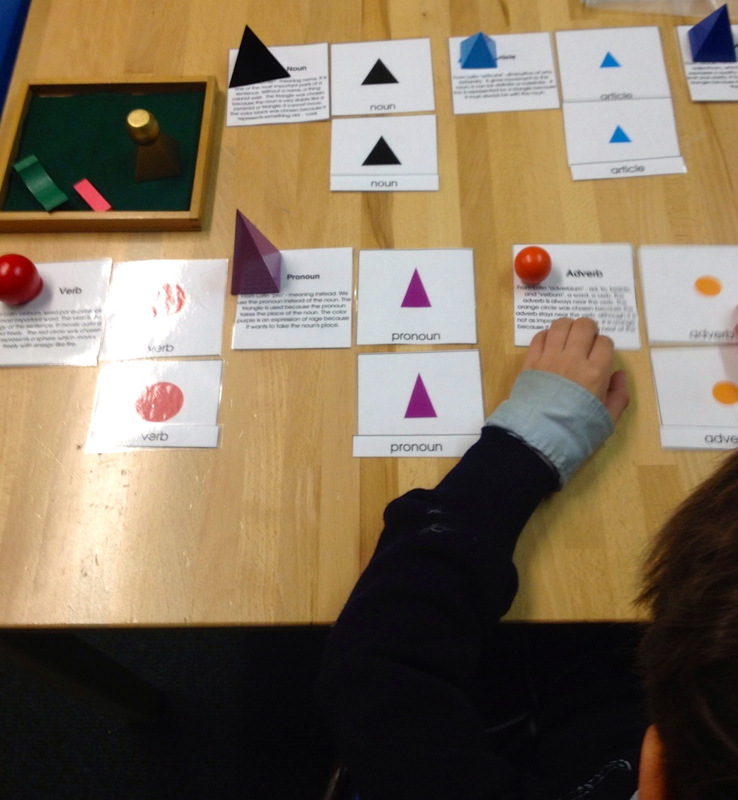 Essential experience for self-study and self-reliance as they approach secondary school. Language arts are a very popular study subject at the moment in the Senior class and among the new materials the grammar symbols are being put through their paces in an almost never-ending cycle. From student to student the learning is being inspired and promoted, it is enchanting to see them work on something and then teach their classmates their findings. It really is peer learning at its best. 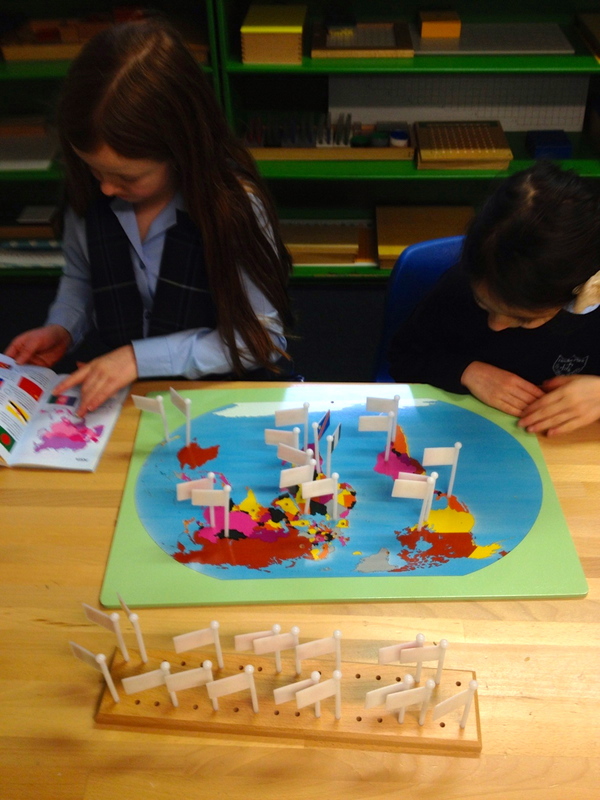 Geographical study is also au current at the moment with jigsaw maps and flags being pored over in great detail. Whether alone or in company the thirst for more information is being quenched in the senior class. The junior class have also been hard at work with their group projects. 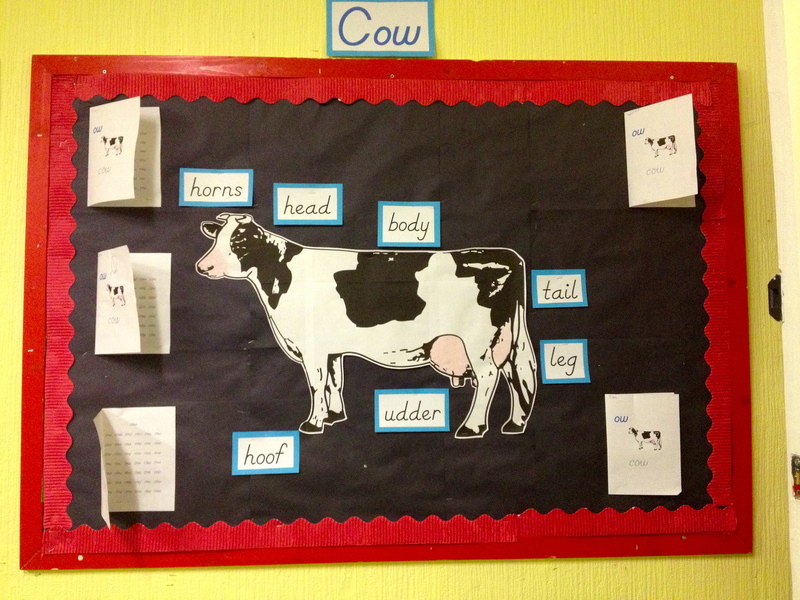 January has seen them working on dairy foods and the cow, a project that incorporated, language, numeracy, science, culture and lots of fun. 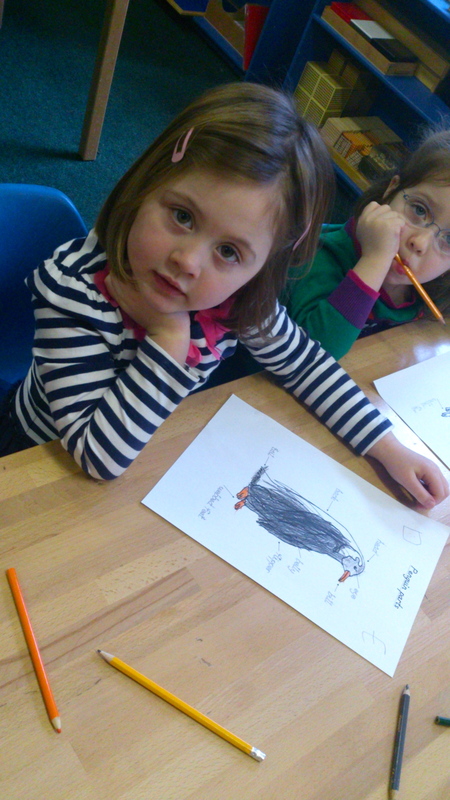 They studied the phonogram “ow” with the word cow, they identified and categorised food products in dairy and non dairy, they studied the parts of the cow and created handwriting samples on many delicious dairy products. They also studied “the land of the midnight sun” in their geographic and cultural exploration of the arctic. A fantastic “frieze” of the vocabulary and iconry of the frozen continent, hung over their large map and individual continent plates. 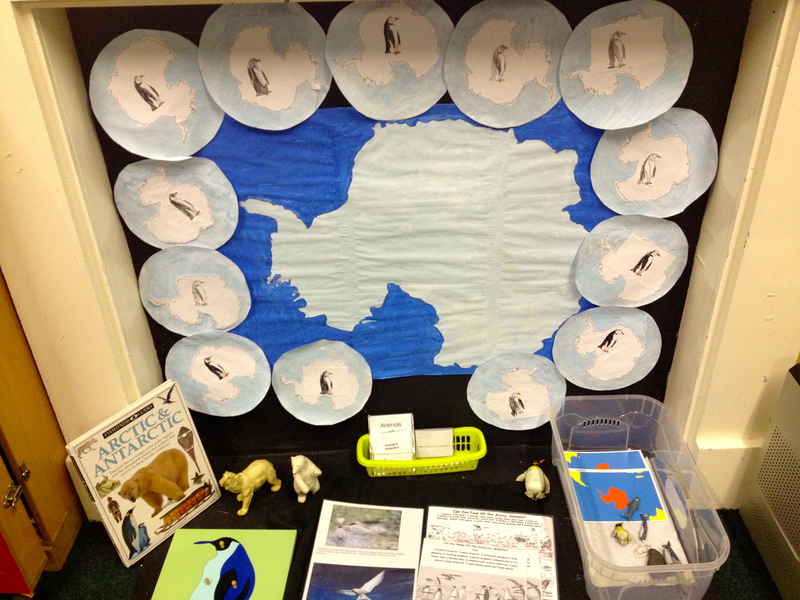 Inspired by our new jigsaw parts of the penguin the junior class have created a large parts of the penguin display and individual ones that they are rightly very proud of. Love was all around in the run up to Valentine’s day, love for their practical life work, love for their parents, love for each other and love for the new materials that are inspiring them to keep asking “can I take more work off the shelf”. As a teacher in such a class it is a joy to see the children motivate each other and themselves, find joy in learning and joy in sharing their learning. Last but by no means least our tiny learners in the reception class who have conducted a tour of the continent of Europe. 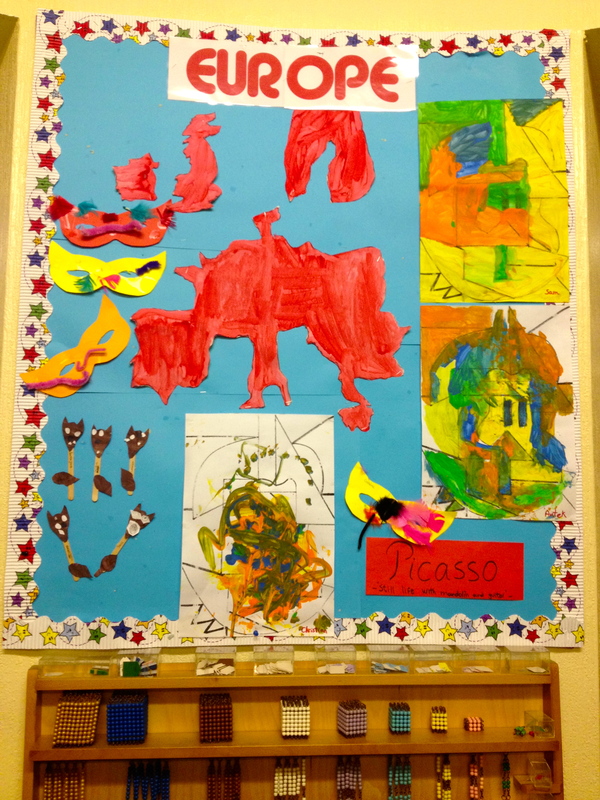 In their educational travels they have spent time studying Picasso’s abstract art pieces, and tried their hand creating their own. They also continued their study of the beautiful French language, and made a magnificent Tour Eiffel. While they made colourful “escargots” I’m not sure tasting them would have been as popular, that said our adventurous reception class are always open to new tastes! 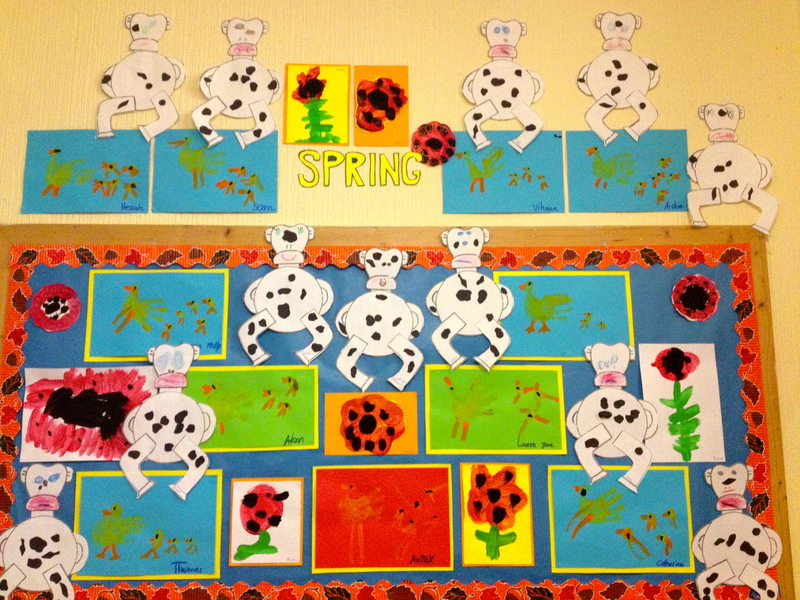 With the change of season to Spring the reception class have created a vibrant display of all things spring, including gorgeous hand print ducks and ducklings, richly coloured springtime flowers and very cute cows. Our reception class love literature, nothing is more enjoyable than reading a book together or exploring our library alone. With that in mind they chose two current favourites Jungle Book and Giraffes Cant Dance. 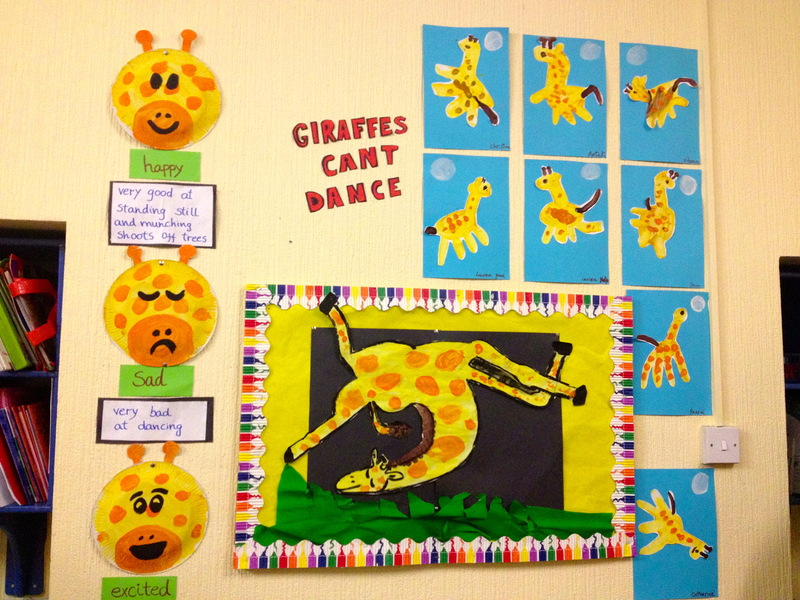 The free painted giraffes are adorable I think you’ll agree and the emotions of the giraffes throughout the story as depicted by the students is a perfect conversation point at circle time or even at home to help our youngsters label the emotions that they feel through out the day. Finally don’t forget to ask about the poem of the month, “Pitter Pater Raindrops” and I’m sure you will be entertained by the rendition at the dinner table or in the car! As usual there are just so many photographs of our beautiful work that we can’t fit them all in the text, so here is a gallery so you don’t miss out on any. Enjoy!